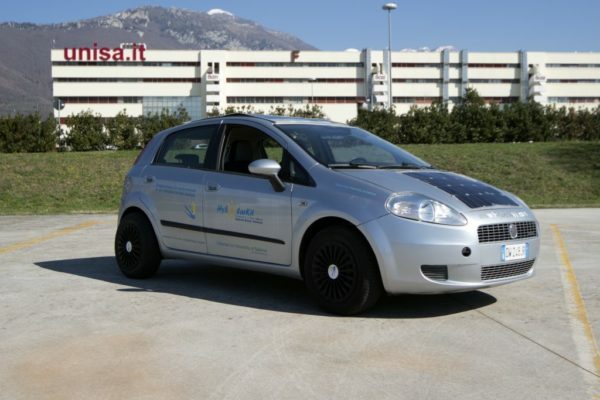 LIFE-SAVE (Solar Aided Vehicle Electrification, LIFE16 ENV / IT / 000442) is a project funded by the European LIFE program for the development and industrialization of the HySolarKit system to convert cars into hybrid-solar vehicles, with very low costs compared to purchase of a new hybrid or electric vehicle. The purpose of LIFE-SAVE is to produce a version of this technology ready to be placed on the market (TRL = 9). At the same time, the qualifying objective of LIFE-SAVE is to encourage the creation of a corporate body among the project partners to continue the industrialization and marketing of the product. Currently, the means of transport are responsible for 63% of global oil consumption and 29% of CO2 emissions and achieving a more efficient, flexible and safer (and less invasive) transport for the environment is now a widely pursued goal. The European Union is committed to reaching a ceiling of CO2 emissions of 95g / km by 2020 and with additional restrictions expected by 2025 (68-78g / km). The 2008 Air Quality Directive has also limited emissions of nitric oxide (NOx) and all major European countries want to achieve a higher degree of energy independence and implement a transport system no longer based only on an intense use of oil. The statistics also show an increase in the number of electric vehicles in the European Union, motivated by the choice of consumers and a fully transitioned automotive industry. the current electricity grid would be thrown into crisis by a general recourse to the recharging of electric vehicles, before major adjustments to the network structure and its “philosophy” (Smart-Grid). Hybrid vehicles are certainly a good solution in the short and medium term to the demand for cars that consume and pollute less. But even in this case a large-scale transition to hybrid traction would clash with some problems: the cost of hybrid cars, more expensive than traditional cars, and especially the need to scrap a large part of the circulating fleet, often made up of good cars conditions. Instead, HySolarKit allows you to convert cars into hybrid-solar vehicles at a low cost, thus allowing you to reduce fuel consumption and emissions, to access restricted traffic areas, to increase vehicle autonomy and performance, and to avoid the scrapping of cars often still in good condition, allowing reuse, which is one of the pillars of sustainability. The benefits of car conversion in terms of LCA have been evaluated by the partners of the LIFE-SAVE project, and are presented in this article. LIFE is the financial instrument of the European Community to support projects that promote the protection of the environment, nature and climate. Made in its first edition of 1992, LIFE is one of the “historical” programs of the European Union. In the current 2014-2020 programming phase, the LIFE program supports the implementation of the Seventh Environment Action Program (Decision No. 1386/2013 / EU of 20/11/2013) “Living well within the limits of the our planet “. It is divided into two main components: an “Environment” sub-program and a “Climate Action” sub-program, which are in turn organized into priority sectors and types of action. Since 1992, Life has co-financed over 4500 projects. For the period 2014-2020, Life will contribute about 3.4 billion euros to the protection of the environment and the climate. The European Commission regulates and coordinates the activities of the LIFE program, implementing many activities and sectors within the Executive Agency for Small and Medium-sized Enterprises (EASME) which determines the methods of implementation and its implementation (management of tenders, awarding proposals, project management, monitoring and evaluation). The strategic management of the program (definition of budget, objectives and priorities) lies with two Directorates General of the European Commission, the DG Ambiente for the “Ambiente” sub-program and DG Clima for the “Azione per il clima” sub-program. The European Investment Fund monitors the financial instruments and methods through which companies can benefit from LIFE’s support. The evaluation system of LIFE projects has been planned by the European Community, and pays particular attention to the contribution of the project itself to promote environmental, economic and social improvements in the medium and long term. The degree of innovation, adherence to environmental protection policies and the cost / benefit ratio are the key criteria for positively evaluating a project to be funded.